Want to visit Ross and Rachel? If you’re looking for a spot to show off to your friends, go to the corner of Grove St and Bedford St. Here, you’ll find the iconic building from the show Friends, along with several tourists. Although the building was shown in almost every episode, it is easily passed by by even the most committed fans due to its refurbished exterior. It sits on top of “The Little Owl,” a small cafe that serves Mediterranean cuisine and is known for its professional yet cozy feel. This tourist attraction isn’t the most noticeable on its own, but when coupled with the dozens of people with cameras in front of it, it’s hard not to notice. Filled with red brick buildings, doors of every color, and shiny brass door knobs, the West Village will transport you to a completely different time period. As one of the richest neighborhood in the city, you’d expect to see skyscrapers everywhere, but instead, you get designer boutiques, small pubs, and trendy cafes. The West Village often draws fashionable crowds. But there are also hidden gems scattered throughout this neighborhood like family-owned businesses, tourist attractions, and business owners with the most interesting lives. Along Grove St, you may also stumble upon French restaurants such as A.O.C and the Buvette, both popular in the area. “This neighborhood reminds me of Europe because there’s a lot of cafes at every corner,” said Marc, a building superintendent in the area who moved from Europe to the West Village in 2000 and now owns 11 buildings throughout Manhattan. He wasn’t wrong about the cafes. There are tons in the area including La Bonniere, Bluestone Lane, Jack’s Wife Freda, and Black Stone Coffee Roasts. Some of these cafes are very trendy with pastel colors and healthy, vegan menus, while others revel in the simplicity of being a cafe. Bluestone Lane is perfect for anyone who wants a good picture and a healthy menu. It’s filled with aesthetics that appeal to millennials and teenagers but is definitely a bit pricey with food items ranging from $10-$30. But if you really want to show off that avocado toast on Instagram, this place is your winner. On the other hand, Black Stone Coffee Roast is the best place to go if you’re into old-fashioned cafes defined by their coffee and not their Instagram-ness. It’s a humble space that is never too crowded -- a great spot to enjoy yourself with nothing more than a book and a treat. In this cafe, you’ll also find Sammy, the owner. He moved to the West Village from Lebanon at the age of 11. He grew up in the neighborhood and has had many interesting encounters over the years. But these cafes don’t capture the history of West Village as well as its small pubs do. The Stonewall Inn bar is great to visit if you want to be surrounded by the neighborhood’s history. This venue is a gay bar and a national historic landmark recognized for its role in the 1969 riots that launched the gay rights movement. This event inspired other stores such as Big Gay Ice Cream to be created in celebrateion of the area’s LGBTQ history. The whole 50 blocks of the West Village were designated landmarks in 1969 by the then four-year-old New York City Landmarks Preservation Commission (NYC LPC), a nonprofit organization dedicated to the architectural and cultural heritage of NYC’s neighborhoods. Historically, this district was an important landmark on the map of American bohemian culture in the early- and mid-twentieth century. Filled with colorful, artistic residents and alternative culture, the Village was a focal point for new movements and ideas, whether they were political, cultural, or artistic. This began an era of small presses, art galleries, and experimental theaters which was known as the “Little Bohemia.” These places include the Cherry Lane Theater, built in 1924, which is New York City’s oldest continuously running off-Broadway theater. In terms of food options, the West Village welcomes all cultures with open arms. One restaurant that represents this perfectly is Taco Mahal, an Indian-Mexican fusion restaurant. It serves Indian dishes in a small roti that you eat like a taco. When you walk into the store, you are greeted by bright orange colors, a wimmelbilder (an extremely detailed picture) painted on the walls, and fun Hindi music blasting from the speakers. It’s a small, sit-in restaurant that is best for a group of two or three people. The tacos start at $4 -- a bit pricey for something about the size of your hand. Regardless, the restaurant had a fun atmosphere and was a great rest stop. If you get overwhelmed by the streets filled with people dressed in designer clothes and Canada Goose jackets, the best place to relax would be the Garden of Eden. One of the hidden gems in Manhattan, this “Secret Garden” hides behind a thick brick wall next to the Church of St. Luke in the Fields (487 Hudson St). You’ll be met by an inviting stone pathway and an arc wrapped with vines. You might run into Stephanie, who will gladly listen to your worries and complaints. Stephanie works in this garden and makes sure everything stays clean. But she is also a great listener for all the people of West Village who are angry with city life. Another surprising gem would be David’s Shoe and Watch Repair. Walking in, you feel like you’ve been transported to the 1940s, but with Russian flowing from the radio. The shop’s vintage style attracts producers for shows such as “Elementary,” a modern story of Sherlock Holmes in New York, who are seeking a vintage look for their shows. 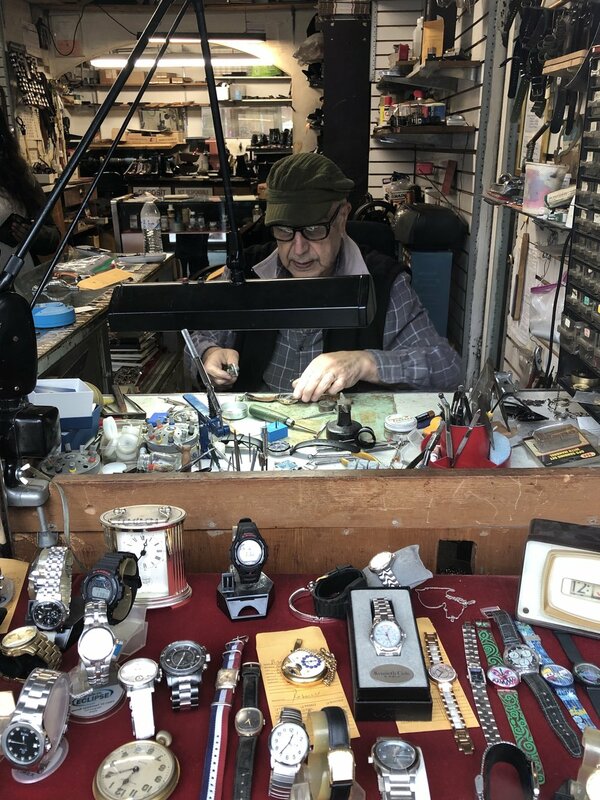 The owner of this shop, David, moved to America with his wife in the 1980s and made a humble business with his knowledge of watch repair. A customer in the shop (also named David! ), said that throughout his 23 years in the neighborhood, he has noticed the loss of “ma and pa” shops like this one, as they have been replaced with commercial buildings and trendy cafes due to higher rents. True enough, if you walk by St. Luke’s elementary school, you can see kids wearing Canada Goose jackets priced at $600 or more. But in the end, the charm of the West Village can’t be denied. “It’s a lovely neighborhood to walk around in, even if it’s lost its soul,” said David. The watch repair shop is small, but it’s filled to the brim with clocks, shoes, and interesting decorations like an old sewing machine and jeweled eggs. It shows that if you look hard, you can still find the timeless history of the West Village peeking out from the corners.